Hydroelectric generation is the primary source of electrical energy across Canada and has been used in the Yukon since the Gold Rush. Hydroelectricity is a clean, renewable energy source that provides reliable power throughout the year. Hydro electricity is created when water is used to rotate a turbine and generator. 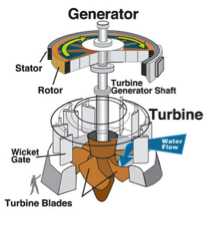 The force of the water spins the turbine, which then turns the generator to create electrical energy. Hydroelectric facilities can be run of river systems or storage reservoir systems. Run of river systems temporarily divert water from the river as it moves and requires no (or minimal) water storage. Rivers naturally have flow that fluctuates. For example, in the Yukon the spring and summer water flows are higher when precipitation falls primarily as rain and when snow and glaciers are melting. In the winter flows are low due to freezing conditions. Water is stored from the summer in reservoirs to make up for low water flows in winter. Figure 1 above shows a typical run of river hydro project. 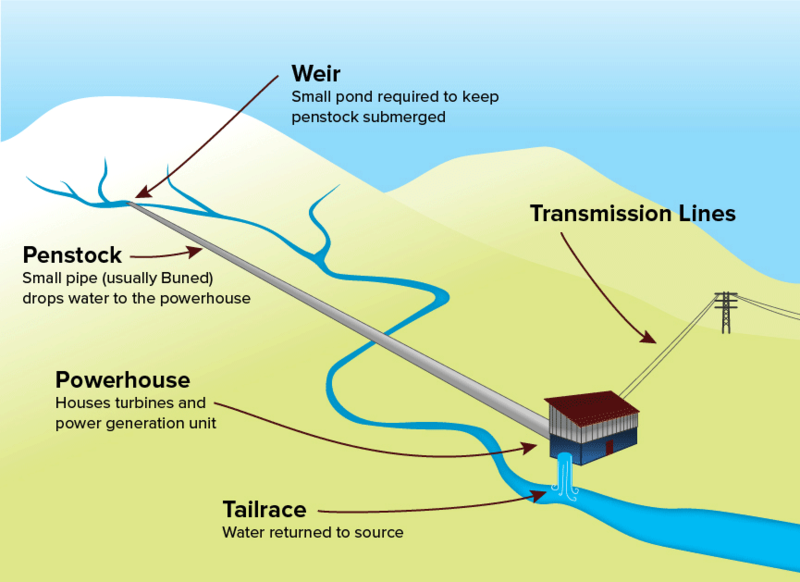 Water is diverted from the river through a penstock to a powerhouse and generating unit where it goes through the turbines and produces power. Figure 2 and 3 below shows storage hydro. Hydro reservoirs store water throughout the year. The water is channeled into a penstock (a large pipe) that then flows into the turbines to generate power. Water is discharged back into the river or waterway at the end of the powerhouse.